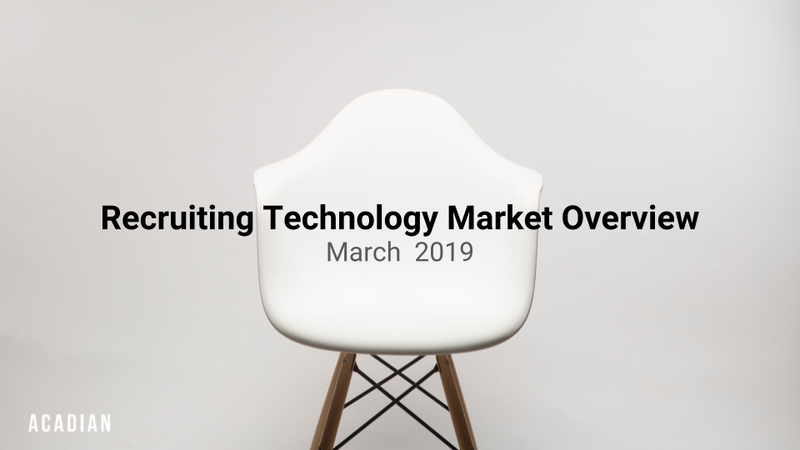 What’s happening in Recruiting Technology? A lot! We are in the midst of a significant technology revolution in recruiting. While corporate spending in recruiting technology continues to grow, expected to surpass $10 billion by 2022, talent acquisition as a function continues to be sub-optimal for most companies. Low global unemployment, general data protection regulation (GDPR), and legacy recruiting technologies (the ATS!) have handcuffed many companies from thinking progressively and making more profound, long-term investments in recruiting technology. How will 2019 be different? We are on the verge of more dramatic market consolidation that will force companies to redefine their recruiting technology stack. Over the last year, recruiting technology has witnessed a feeding frenzy of private equity (PE) investment. Vista Equity Partners purchased a majority of iCIMS at a valuation believed to be around $1.2 billion. More recently, K1 Investment Management spent over $200 million to roll-up Jobvite, Talemetry, RolePoint and Canvas. Lessor known PageUp People took on additional growth equity investment from Battery Ventures. Why is market consolidation important? When you combine a consolidating market with lethargic incumbents, new ideas and companies begin to emerge. One simply has to look at market share data over the last few years to understand change is already underway. 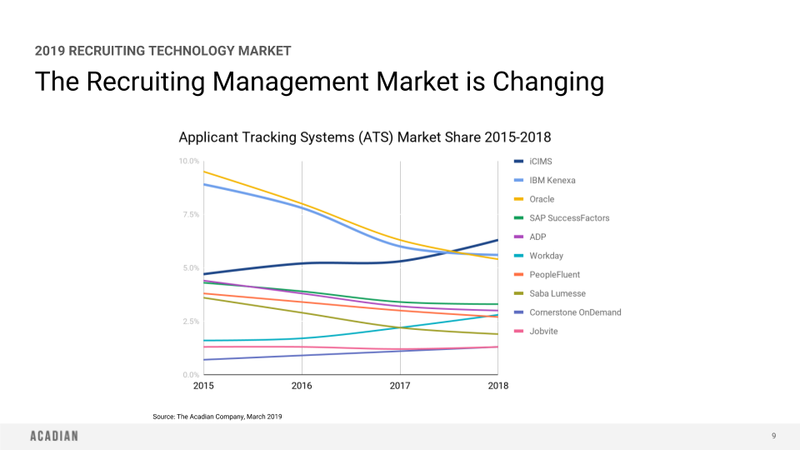 Oracle and IBM, in particular, are hemorrhaging market share (see above) and customers are now demanding that their core recruiting platforms do more than just process applicants. They must also become global marketing platforms that engage their audience (i.e. candidates), drive corporate initiatives such as diversity and inclusion, and support career and pay progression. Consolidation also breeds innovation. Innovation, though, often requires fuel in the form of venture capital. 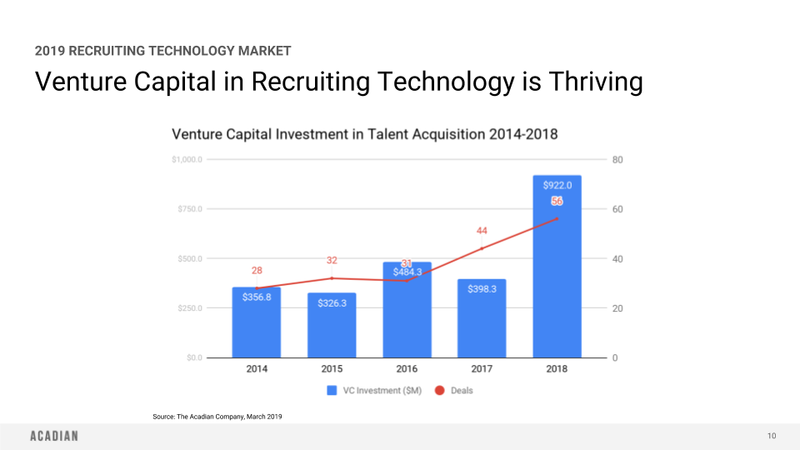 In 2019, we saw nearly $1 billion flow into venture-backed startups in recruiting technology, more than 2016 and 2017 combined. Recruiting technology has long attracted investor interest. With the emergence of a new technology shift, leveraging cloud infrastructure and artificial intelligence (AI), investor interest in recruiting technology has been reignited. Most importantly, recruiting technology has become global. Throughout the world, online learning has leveled the skills divide. Companies are now looking in every geography when building new teams and the talent pipelines that support them. Understanding global data privacy rules has never been more important and technology must be used to manage the increasing and ever-changing complexity. advisor, investor, storyteller, recovering operator, former strategy guy @CornerstoneInc.